So you want to be the next Tommy Emmanuel. Or maybe someone you have been looking up to for a while. You can already imagine yourself in front of hundreds of fans that have camped out for days just to hear you perform live and take in your genius as they sob to your melodies. There is just one big problem: You have close to no knowledge of guitars. And I am not talking about playing, I mean literally have no idea how a guitar works, how the sound is created or anything about the structure of a guitar. That is how anyone starts so trust me you are not the only one. Eric Clapton at some point in his life new squats about guitars so do not fret, my friend. Of course, you can also be a guitar player and not know “theoretical” details of guitars and that is why you are here. In any case, let’s get into it. The world of guitars is so vast it seems like an impossible task to actually understand what is what. If you have narrowed down your interest to acoustic guitars, that is already a great news. BUT it does not mean that there are not different varieties of acoustic guitars. There are acoustic in different styles, forms, for different genres, you also get an electric acoustic guitar which is a totally different type of a beast and nylon stringed guitars of course. If you already have a guitar that means you have done enough research on what style you want to play or what guitar will be the most comfortable for you. IF you have not, then you are in a good place. First things first, let’s talk body of the guitar. There are varieties of body styles for acoustic guitars, starting from a dreadnought, one of the most popular styles, going through jumbo, grand concert, etc. In order to figure out which one you need at this point, you should know which body style does what. Dreadnought guitars have a huge history and fan following. It is also one of the most widespread and beloved guitar body styles that can be used for basically any style of playing. This body style usually has quite a large soundboard and wide bout providing very nice volume. On the other hand, a lot of beginners do not feel that comfortable with dreadnought sized guitars. That is why a lot of manufacturers started producing ¾ sized dreadnoughts. The ¾ size dreadnoughts bring together the comfort and sound of the full sized guitar. Jumbo is one of the larger, curvier body styles. The large body style creates incredible sound that not that many other body styles have. Jumbo was popularized by Gibson and their “Super Jumbo” creates the sound that is unmatched by any other guitar. Although, Jumbo guitars might be great for an experienced player, I would not recommend it to an absolute beginner because it is harder to play and is not as versatile in styles as, for instance, a regular dreadnought. With over 150 years of history, concert guitars are smaller sized models (12-½”). They are much easier to handle and produce brighter, punchier sound. On the other end, there is also grand concert style guitars. They are a bit bigger than regular concert guitars and have better volume and would be a better fit for more experienced players. This mid-sized auditorium guitar has a beautiful balance of tone and volume. The size of this guitar sort of brings together the best of the two worlds. It is not too small to have a tiny sound but at the same time, it is not too big to be extremely uncomfortable for beginners. There is also grand auditorium which usually has a wider lower bout, better higher volume. The neck of the guitar is the second thing you should keep in mind when deciding on the guitar. There are a lot of different parts connected with neck or are a part of the neck like headstock that have machine heads that regulate the pitch, fretboard (usually another piece of wood that is glued to the neck’s wood), truss rod that keeps your neck from warping due to string tension, nut and frets. Basically, you get the point – neck is EXTREMELY vital in how your guitar functions. I will not get too deep into the conversation on details and which ones are the best but one main thing you should consider is the width of the neck. If you are a beginner make sure that you try out several different guitars in person and understand what size and width of the neck are the most comfortable in your hand. Now that we have gone over body styles very briefly, (and I mean very briefly, there is so much more to body styles which you should research more in-depth if you are really interested in buying an acoustic guitar) we can move to discuss different tonewoods that are used in acoustic guitars. It would be impossible to discuss all of them so I will try to go through some of the properties of the popular, or more mainstream, ones. Tonewood plays as much role in the sound of the guitar as the body style. That is why whenever you see a review or specs of a particular guitar you will always encounter “tonewood” first. It would be a nice thing is all guitars had the top-notch quality tonewood that will make your guitar go from 1 to 11 but you will rarely get a beginner’s guitar at a reasonable price that will have the highest quality tonewood. That is why you should know what certain tonewoods do so that you can know which one will fit your style (if you know what style you want to play, of course). Most times different parts of the guitar, like top, sides, back are made from different tonewood. And while all different parts of the guitar are vital in the final sound, the top of the soundboard is the number one part of the guitar that makes it sound the way it does. Spruce is one of the most used tonewood for guitars (not just top) and while there are so many different spruce woods, like Adirondack, Engelmann, Lutz and many more. Each variety has slightly different characteristic but most spruces are lightweight and have wide dynamic range. They also range in prices. For instance, Adirondack is the priciest one with better overtones. Mahogany – one of the most popular and in-use tonewoods on the market today is mahogany. This wood is quite dense and produces great sound with slow response. This tonewood has low in overtones and is often popular in guitars used for blues and country music. Maple – This tonewood often has a low response and flat sound. It is usually used for backs and sides but is also great for top wood. Maple is great for live performances. Rosewood – There are few varieties of rosewood, with Brazilian being more abundant on the market. You might consider buying rosewood top guitar if you are interested in rich overtones and great projection (and who is not, to be honest). That being said, like spruce, there are several different rosewood and they all vary in quality. Rosewood is usually quite dense and heavy and produces a warm tone. Often enough luthiers use is for back and sides. Sapele – I think sapele is one of the tonewoods which is very underrated. It is similar to mahogany but has a lot lower price. It is denser than mahogany but has the same balanced tone. If you are looking for warm tone and great resonance at a low price, Sapele is a great option. If you continue reading this article you will see there is a separate section for accessories. AND strings, while being accessories, will not be included in there. There is one major reason for this. Strings, although a small part of a guitar, is not, by any means, trivial. There are nylon and steel guitars and using nylon strings for steel guitars is not an option. 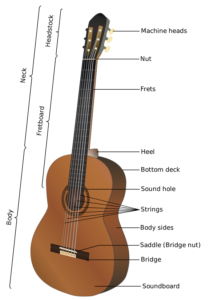 Nylon strings usually have mellow tone and used in classical styles or folk style playing. Nylon strings are also easier to handle for beginners. If you use steel strings, for instance, on an old nylon string guitar, the neck might warp due to pressure. That is why NEVER dismiss the importance of strings. On the other hand, steel strings while being a little bit harder to play produce louder and brighter tones that are great for rock or pop music. That being said, there are different gauges in both strings (light, medium, heavy) and that also changes a lot of the factors. There are so many accessories on the market that claim that if you get that accessory if will take you from zero to a hero (in the musical sense). Most times that is not true. And by most times I mean ever. Accessories will not make you an exceptional player if you do not practice enough of have zero talent BUT if you do not have some accessories the process of learning will become a lot harder. There are hundreds of different accessories like picks, pickups, tuners, metronomes, gig bags, cases, stands, wall hangers, strings, straps, strap locks, etc. If you are on a budget you probably do not feel that keen on spending more money on accessories. You have to decide on your needs and then go from there. Picks – For instance, I think picks are one of those things that are quite important, especially for beginners. They also cost just a few dollars so you will not empty your pocket if you buy one. Even though picks are such a small item they play a big part in the way you play. They also come in a lot of varieties. Some of the things you should consider when picking a pick (yeah… I went there) are material, thickness, shape, and texture. Tuners – Tuner basically detects and displays the pitch of your guitar so that you can tune your instrument properly. While you can do it with your ear that is rather a hard task, especially for a beginner with no experience. There are varieties of tuners ranging from LED to needle dial tuners. They also range in price (very drastically) and often tuners are also metronomes. Gig Bags/Cases – When you get your guitar you probably are not thinking that much about what could go wrong with it. The thing is, a lot of things could go really, really go wrong. Imagine: you just spent weeks or months researching guitars and finally found the one and only guitar that matches all your requirements and budget. You are psyched to start practicing. You bring it back home and put it in your living room or dorm room or wherever. Somehow, your drunk friend stumbles into the room and accidentally pushes your guitar from his way. Or, I do not know, something horrific happens and your guitar just falls and gets damaged. So now, all the months you spent finding your guitar have gone down the drain. So that this kind of a thing does not happen you have to get a case or at least a gig bag. There are a lot of pros and cons to both. The most obvious ones: 1. A gig bag is light and good for transportation but it does not keep you guitar completely safe from accidents or humidity change 2. Cases are very good at protecting guitars in any situation but they are extremely heavy, hard to transport and expensive. Some of the hardware (you probably will not need anything too complex at the beginning). Strings (do you want a steel string guitar or nylon string). You CANNOT use nylon strings on steel string guitar and vice versa. Accessories (that is not “part” of the guitar per se but for the wholesome experience and learning you might want to look into certain accessories. If you have gone through this article, you probably gained some understanding of what you should be looking at when you search for the one and only – the best acoustic guitar. But you should also know that something that is considered great for certain people might not be a good fit for you. Take your time, maybe days of intense research or weeks of just going around the store and trying out how comfortable you feel with guitars, talk to professionals and make a decision. You should definitely NOT rush this process because once you get a guitar that baby will last you, hopefully, years and year. It will be the main factor of how your learning process will go so tread lightly.